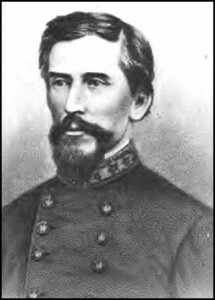 One of the South’s greatest field commanders, Patrick Cleburne was an Irish immigrant who established himself in Helena, Arkansas, before the War. A prominent attorney and a veteran of the British Army, Cleburne formed a regiment at the outset of the War, the Yell Rifles, and served as its colonel. Cleburne’s first assignment brought him to Greenville, Missouri, where Confederates under William J. Hardee established a base camp on a line which extended the Cumberland Gap to Columbus defense line into the trans-Mississippi. Hardee retired to Arkansas in mid-August, 1861, as U.S. Grant began to apply pressure to Confederate troops in Missouri. Cleburne went on to fight in nearly every battle in the western theater, achieving the rank of Major General. He died leading a charge at Franklin, Tennessee, November 20, 1864, and is buried in Helena.